NOTE: A smartphone is required to setup and manage your Gryphon router. Download Gryphon App on your smartphone and create an account using your email address. 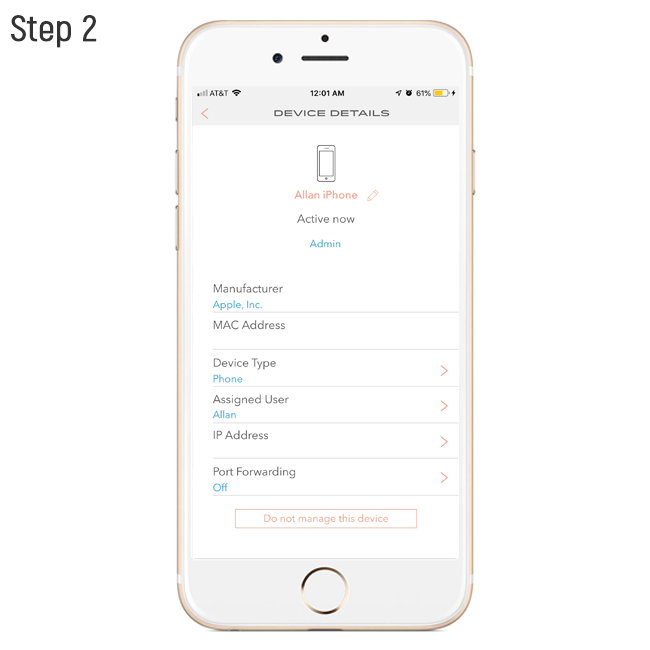 Once you’ve setup your account, the app will begin the installation process. 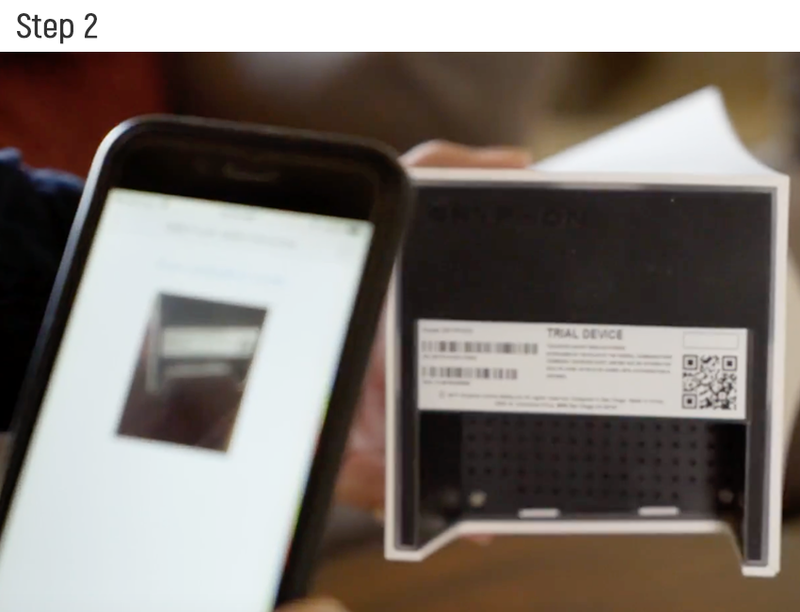 Using your smartphone (through the app), scan the QR code at the bottom of Gryphon router. 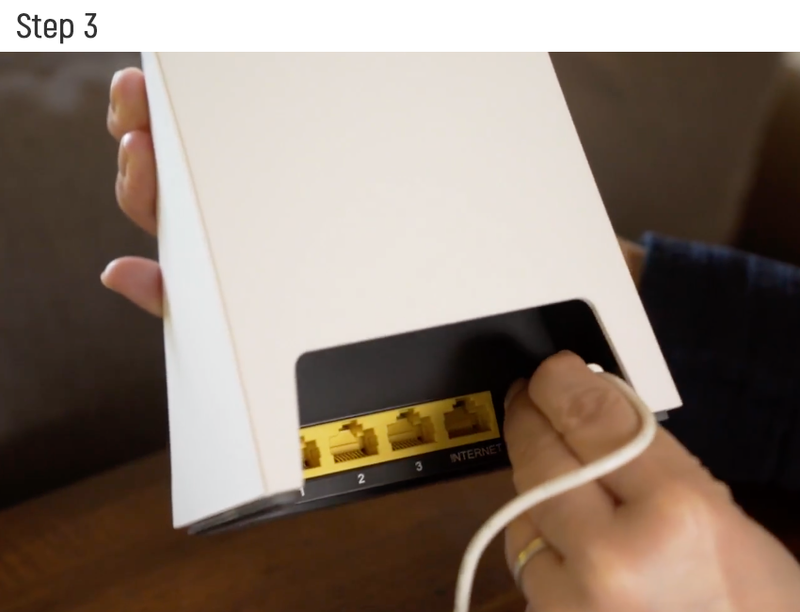 Connect the provided power adapter to Gryphon router, but DO NOT plug power adapter into the wall yet. 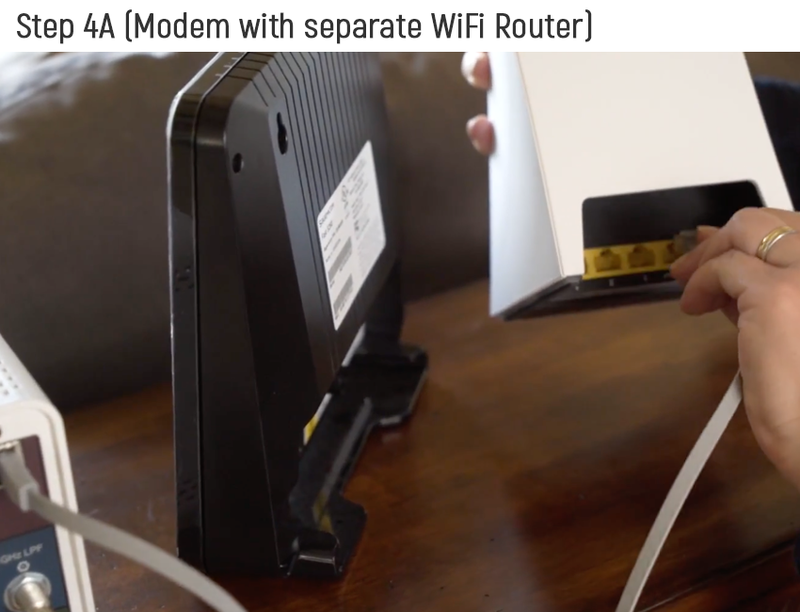 Unplug ethernet cable connecting your modem to your old router and then connect the cable to your Gryphon router. 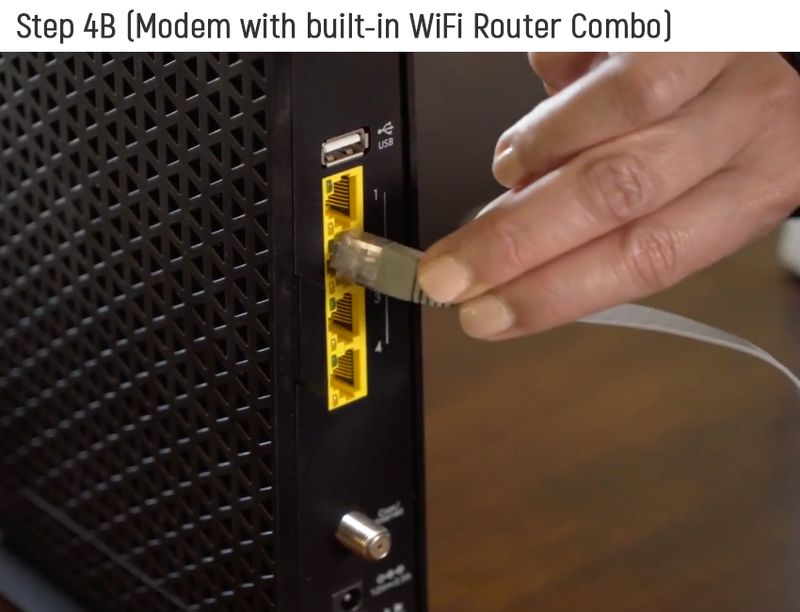 Using the supplied ethernet cable, connect Gryphon router to your modem/router combo. Plug in the power adapter to wall and wait for the light under Gryphon router to start blinking. 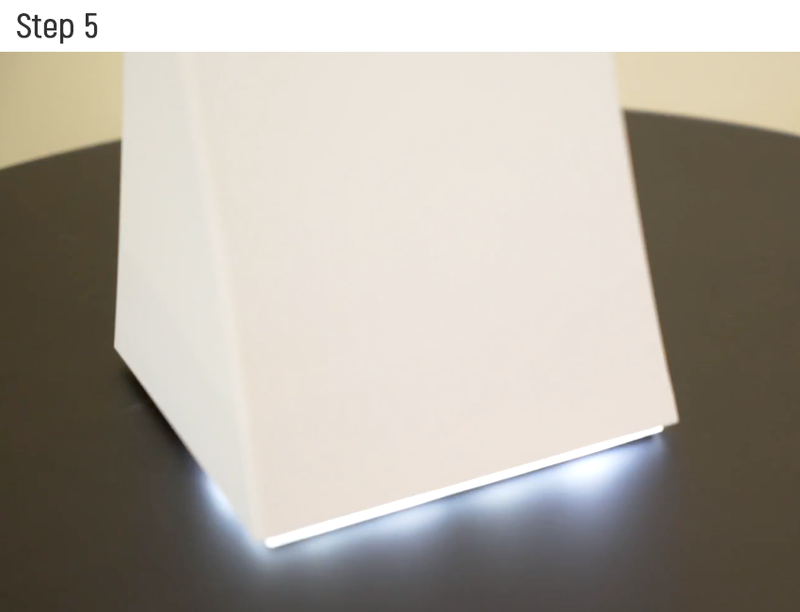 Once light under Gryphon router is blinking, click connect button on the Gryphon App. Make sure there is Internet service to the Gryphon WiFi router. If using an Android phone, make sure it supports Bluetooth LE. Make sure the Gryphon router is not already paired with another account (Gryphon will not blink if it’s already paired). 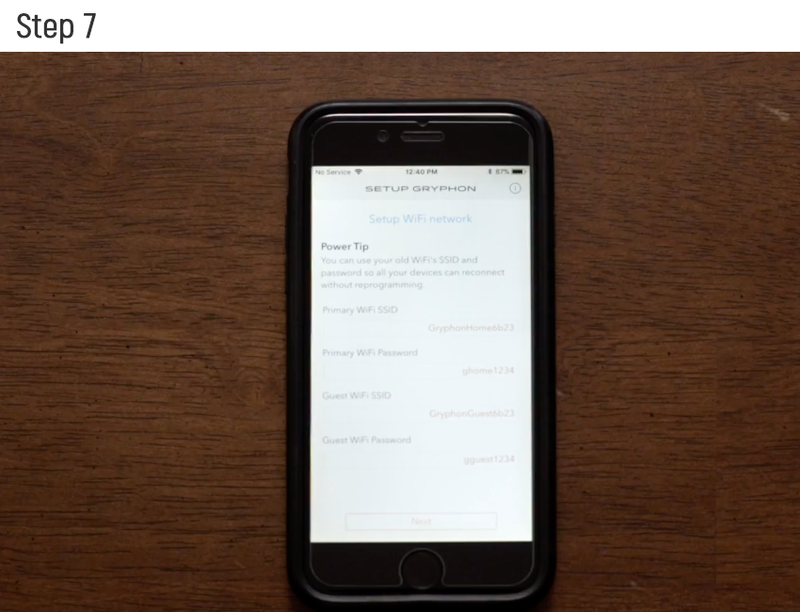 Once pairing is complete, set your network name and password and click DONE. 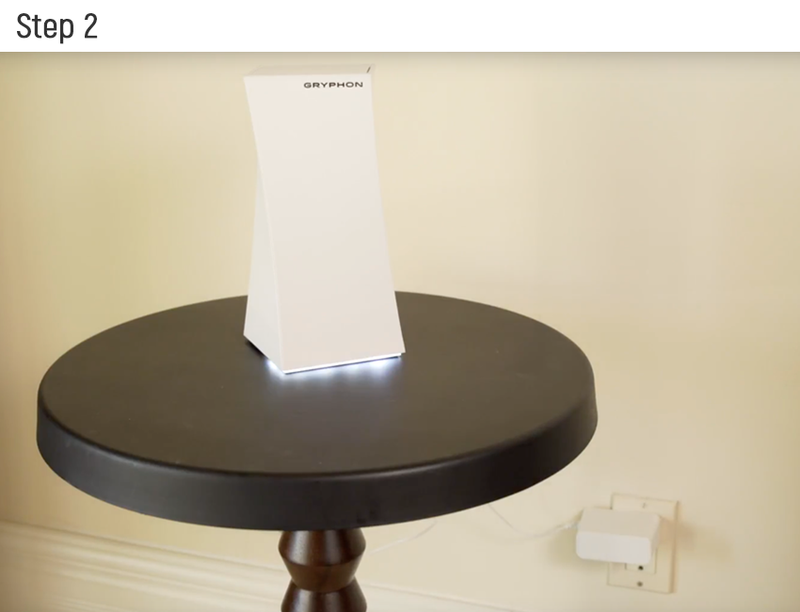 Wait 2-3 minutes for the Gryphon router to reboot. Step 8: Connect all of your devices to the Gryphon network. NOTE: If you have a modem/router combo, make sure to disable the old WiFi network or change the password to make sure your kids are not able to bypass the Gryphon. Step 1: Open Gryphon App and setup a user profile for each family member. In Gryphon App, click USERS (bottom left of menu bar) to access User Profile screen and enter name of user. You’ll also have the option to upload a photo under their account. NOTE: For members without their own WiFi device, you can set them up under the default shared profile named ‘Family’ or create a custom shared profile. NOTE: For details about each filter category, click on the INFO icon. Toggle each feature ON and choose which days and start and end times you’d like the restrictions to apply. ‘Bedtime’ pauses the internet until a specified time in the morning. 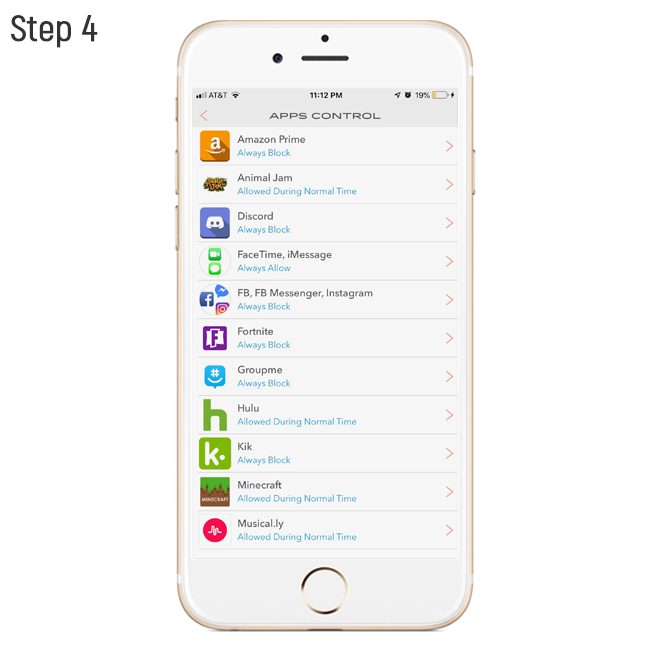 ‘Homework time’ allows internet access, but blocks internet access to sites and apps you choose (like Amazon, YouTube, and Facebook) during those the timeframe. 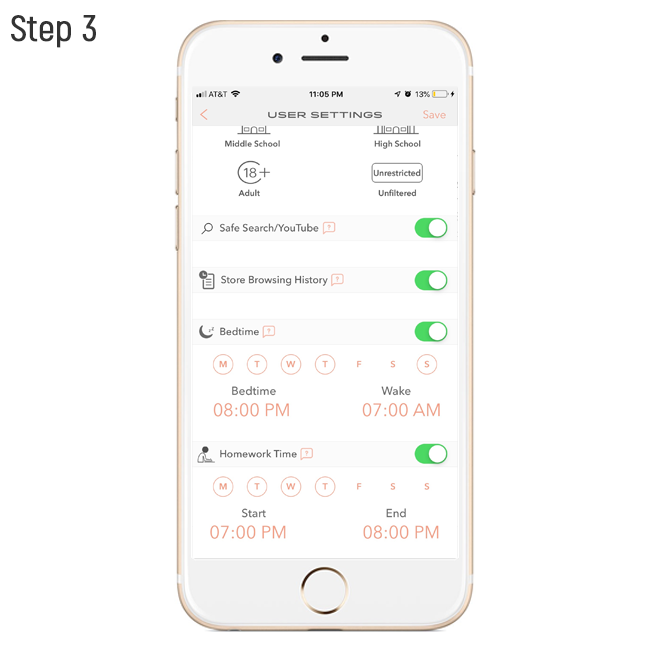 ‘Apps Control’ allows you to choose which apps can connect to the internet during restricted ‘homework times’ and normal times for each family member. Once you’ve finished up all the settings for the user, click SAVE in the top right corner of the screen. Repeat the process for each family member. In the WiFi settings of your device, find your Gryphon WiFi network and connect to it. In the Gryphon App, click the notifications tab and click the new WiFi device listed. 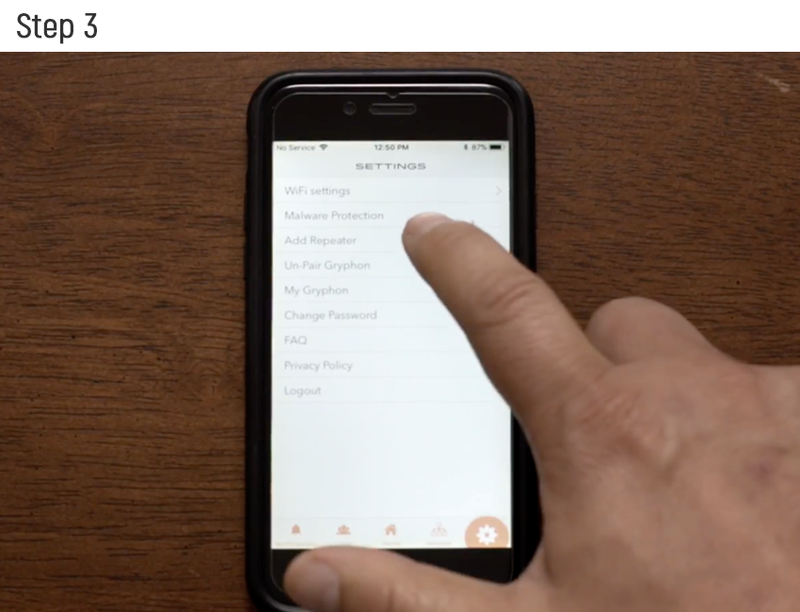 Follow the prompts to assign the WiFi device to a user. 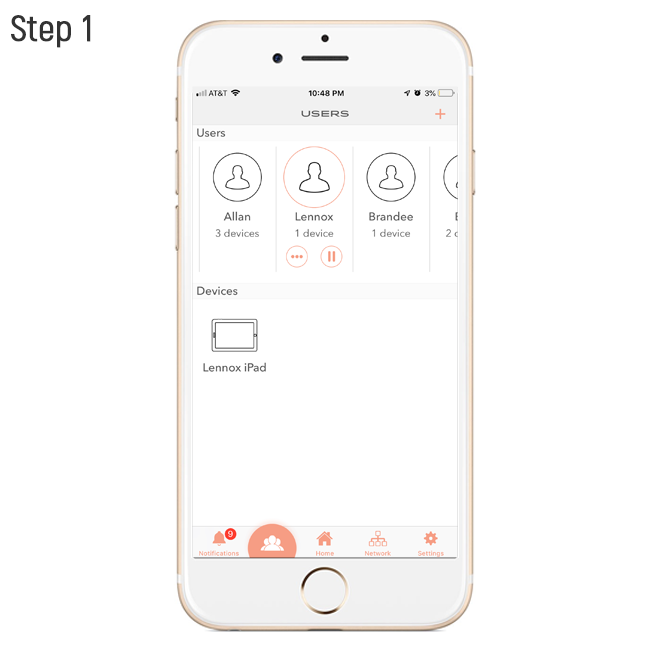 If the new device isn’t automatically identified, you’ll need to manually select the type of device it is first and then assign to user. NOTE: Some devices, such as TV’s and printers, will not be assigned to a specific user, but will still be protected by Gryphon from malware and intrusion. Can also be assigned to share user account (i.e. ‘Family’). INCLUDING: Mobile phones, WiFi tablets, desktop computers, laptops, gaming systems (i.e. Playstations and X-Boxes), streaming players (i.e. AppleTV, Roku, Amazon Firestick), and smart TV’s. Complete all previous steps prior to setting up Gryphon wireless mesh repeater. Plugin power to the new Gryphon router to be used as your wireless mesh repeater, making sure it’s at a location where it receives a good signal from the main Gryphon router. This is typically within the line of sight and within 25′ of the main Gryphon base. The additional Gryphon mesh repeater can always be repositioned after setup. Open the Gryphon App, go to SETTINGS, and then select ADD REPEATER. 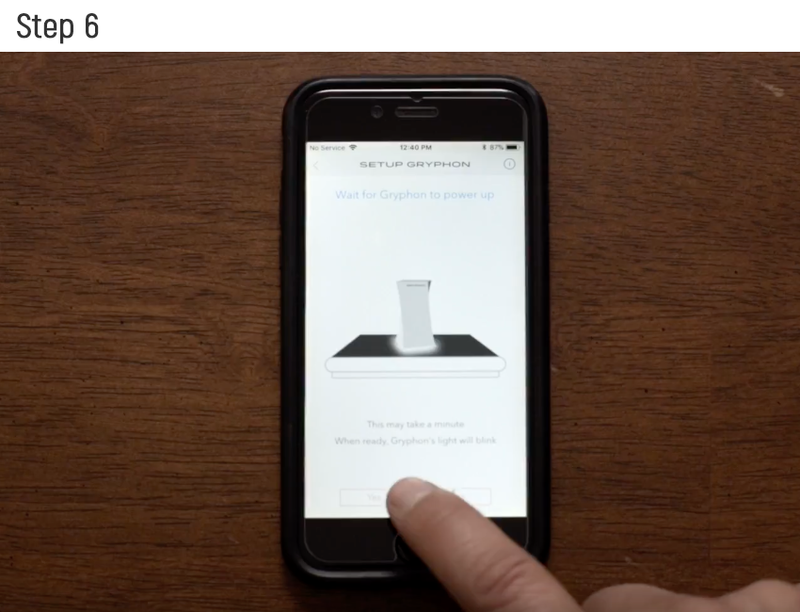 The step by step guide in the Gryphon App will instruct you to scan the QR code on the bottom of the Gryphon mesh repeater using your smartphone’s camera. Wait for the light on the bottom of the Gryphon repeater to blink and click the PAIR button on the Gryphon App. It will take a few minutes for the system to auto configure once paired. Once connection is complete, the repeater light will shine steady. NOTE: If needed, reposition the Gryphon elsewhere in your home to improve coverage. Simply unplug and replug power adapter and the repeater will automatically reconnect to the Gryphon base. 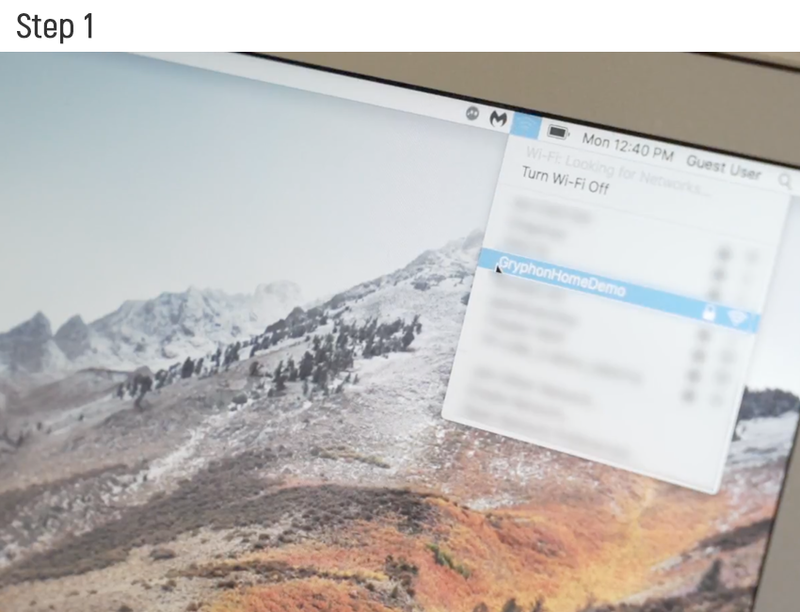 The following video tutorials show how to use the Gryphon App to easily manage all of Gryphon’s features, including device management, homework time, bedtime, security alerts, and port forwarding. Do I need to call my ISP before replacing my router? How many Gryphon routers do I need for my home? Gryphon is a high powered WiFi router with six powerful internal antennas but it really depend on the house size and what you intend to cover. For a typical 2/3 bedroom house, a single Gryphon will be good. For 3-5 bedrooms, you will need two Gryphons. To cover the backyard as well, you may need an extra Gryphon. Also, if you have a three story home, two Gryphons are recommended. This is just a rough guide. The wall construction of the home is also a factor. What mobile devices I can use to set up and manage Gryphon? You can use either iPhone or any Android phone App to manage Gryphon. The mobile device needs to have data connection. What's the best location to setup Gryphon? We designed Gryphon to be displayed in the open for better signal and coverage. We recommend you place Gryphon somewhere central in the home but out in the open to provide the best wireless signal for the entire home. If you are using wireless mesh with more than one Gryphon, then place the second Gryphon somewhere where it can receive a good signal from the main Gryphon for the best performance. 1) Please make sure there is Internet service to the Gryphon WiFi router. 2) If you are using an Android phone, make sure it supports Bluetooth LE. 3) Make sure Gryphon is not already paired with another account (Gryphon will not blink if it’s already paired). 4) If all else fails, please contact support@gryphonconnect.com and we’ll get right on it. On the back there is a hole next to the power plug labelled RST. Wait until Gryphon is fully powered up (about 90 seconds). Use a pin to push and hold the button for about 15 seconds. Then release. Gryphon will power down and then power back up fully reset. There is no need to do anything. Gryphon has detected a site that the device is trying to access and has blocked access to protect your device. In some cases, the virus on an already infected device will be trying to contact it’s server on a periodic basis. If the device is already infected, you should take it off the network and use a virus cleaning software to wipe the virus or in some cases, you will need to reformat your device. Gryphon blocks inappropriate content automatically based on age group. If you want to block a particular site that your child has visited, it can be done from browsing history feature in the app. Select the website to block from child’s browsing history (you will see an option to block). Click on block and it will be blocked for that user. If a site is already blocked, the Unblock option will be displayed. Click on Unblock to unblock the site for the user. You can go to www.gryphoncare.com to request for a site to be unblocked, request for more time before bedtime, or end homework time. The Gryphon Connect app will receive a notification for the request. How do I see what web sites my child is on when she/he's on the computer? 1) Open Gryphon App – Select “Users” tab on the bottom row. 3) Select the … button. This will show user’s details and browsing history. 4) Make sure history is turned on in the user’s profile. In the Gryphon App, click on the device to get into device details. Click on the Assigned User item. Select the new user to assign to. Type what you need help with in the search box below. You’ll be automatically directed to our Knowledge Base and given the option to submit a support ticket to our 24/7 Customer Service center. You can also use the HELP button on the bottom right corner of the screen.